Dave Ulliott is the man known as “The Devilfish.” The devilfish is a poisonous fish which can kill if it is ingested when it is not properly prepared. 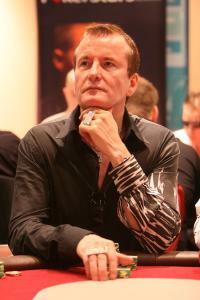 Dave Ulliott was born on April 4, 1954 in Hull, UK. He dropped out of school at 15 and began work at a trophy shop. He got into betting on horse races and was fired from his job for skipping out one day to see a horse race. Afterwards, he got involved in organized crime, and was thrown into prison several times. The last time he was released from prison he had been planning on committing a bank robbery, but his partner was arrested on the day it was scheduled for. His partner’s wife urged him to go straight and he did, not committing a crime since. Devilfish started playing poker as a boy, and when he grew older, began playing in the games around London and was a frequent winner. When he went to private games, Dave Ulliott made sure to bring a gun with him to make sure he wasn’t robbed. He did have to brandish it once to scare off some would-be thieves. In 1997, Dave Ulliott went to Las Vegas for the first time. It was here, in the $500 Pot Limit Omaha Event of the 1997 Four Queens Poker Classic that Ulliot’s nickname of “Devilfish” became widespread. Ulliott was heads-up against Men the Master, whose supporters were cheering him on with “Go on the Master.” Ulliot’s friend who came with him on the trip then started cheering “Go on the Devilfish.” The nickname of “The Devilfish has stuck with him ever since.” Before that event, Ulliot’s nickname was “Dave the Clock,” as he once used a grandfather clock to buy-in to a tournament where a furniture salesman was playing. Dave Ulliott won his one and only World Series of Poker bracelet in the 1997 World Series of Poker $2000 Pot Limit Holdem. He has come in second numerous times at other WSOP events, but has never managed to win a second bracelet. In two of his second place finished “The Devilfish” was eliminated while holding pocket aces. Dave Ulliot formally played online poker at UB Poker under the screenname “Devilfish.” Ulliott also has his own poker site, Devilfish.com.